As Travel: Travel by air. 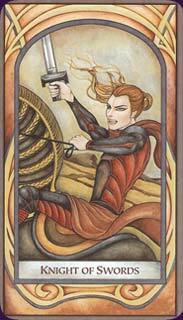 As Change and Movement: This is a card that indicates a time and environment of rapid changes. In the positive, there are rapid thoughts; ideas fly, problems and challenges quickly appear and are quickly solved. In the negative, there might be too much thinking. This is the most "Knight" of the Knights, meaning things will feel restlessness, will change direction in a blink, or go from zero-to-sixty in a second. There will be an inclination to argue. It could be frightening and worrying, but also mentally stimulating. As a Teen or "Teen-like" Person: Too smart for his own good, the Knight of Swords is also too talkative. He/she is the sort to get into a dozen flame wars on a dozen internet chat sites. This is the sort of teen/teen-like person who will questions his teachers (bosses), likes to play devil's advocate, and argue with his friends and family just for the sake of arguing. Cool and logical, he can be very smart and amazing at problem-solving. This, however, can make him arrogant, cold, even cruel to those he views as not so bright. This sharp mind and sharp tongue can also lead him to spread gossip or nasty rumors just to see what will happen. He may be an internet troll or hacker and likely to cause serious trouble or get into serious trouble because of it. He fails to consider the consequences of his words, and can be uncaring about others feelings. He is, however, a good Knight to have on your side, as he will find clever ways to win in battle. If there's anything this knight will fight and die for, it is for freedom of information and speech. Learn the Knight of Swords tarot card meaning and the rest of the card meanings, symbols and stories in our eBook.